1. Cuttings – This is a vegetative method of propagation which produces plants that are identical to the mother plant. 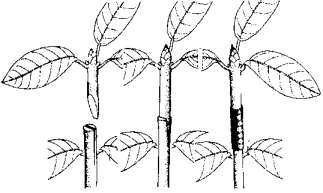 Cuttings (sometimes called scions) are taken off of semi-hard wood any time between less than a month after the new growth is made, to about six months after growth. In the northern hemisphere this would be somewhere between the months of May through November. Generally, softer wood roots more readily than harder wood, though the softer the wood, the more likely it is that problems will occur with fungus diseases. So sanitation is important. For planting use new bark, sawdust, clean (coarse if possible) peat, perlite, or coarse clean sand mixed in practically any combination. The main thing you want is a medium that has some humus (bark sawdust, peat) to hold moisture and an inert matter (perlite or sand) to provide air spaces and drainage.The cuttings should be made from the tip growth, cut from 2.5 cm to 10 cm (1″ to 4″) long, depending on the growth size of the plant you are trying to propagate. 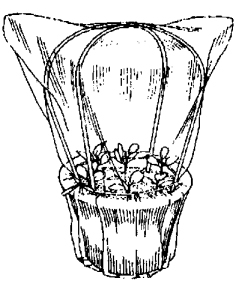 The lower leaves should be removed and often the ends of the top leaves are shortened to provide more space between the cuttings, to allow air circulation and to lessen the amount of foliage the scion has to feed while it is rooting. Wound the cutting with a cut on each side, about 12.5 mm to 25 mm (1/2″ to l”), just deep enough to cut through the bark. Dipping the cutting in a rooting hormone containing indolebutyric acid wll make rooting easier. The exact formula depends on the hardness of the cutting and the difficulty in rooting the cultivar you are tying to propagate. Experience is the only good teacher as to the strength needed, though most commercial rooting hormones will give some instructions.Preferably the rooting bed you use for these cuttings has some form of heating to keep the soil temperature near 21Â°C (70Â°F) (though many cuttings will root without heat) and some type of mist system that comes on and off to keep the foliage moist. You must be sure that the mist system does not put too much water in the soil, as soggy conditions will rapidly promote disease. A variation on this moisture supply is to build a frame over the cutting bed, cover it with plastic, and make sure it is not in direct sun. For summer propagation the simplest method may be a small wooden flat with a plastic cover set in a shaded location. To root one or two cuttings, even a glass jar filled half way with the above mentioned rooting soil, lightly watered, sealed with a lid and left in a north window may do the trick. Remember, some rhododendron or azalea cuttings root easily, often within 6 weeks, while others may take 3, 6, 9, or 12 months to root, or may not root at all. Don’t be discouraged by your first attempts. However, don’t expect to cut a limb off of your plant, stick it into the ground next to your plant and have it root. It may stay green for several months, but has virtually no probability of forming roots. An example of rooting cuttings in a pot in a plastic bag. A simple home method used to root a few plants. 2. Grafting – A different vegetative method of propagation, grafting, takes a difficult to root cutting and grafts it onto an already rooted plant. There are many methods of grafting and times of the year it can be done. Our brief discussion will tell of one method. In the spring just before growth starts, take a cutting and prepare it much as we mentioned in the section on cuttings, only this time cut the bottom end of tbe cutting into a long “V” shape. Then take the plant you are using as understock and cut a slit about the length of the “V” you cut on the cutting. This slit can either be at the tip of the limb of the understock (top grafting) or into the side of the limb (side grafting), but it should be in wood where the bark is still green. Be sure to match the cambium layers (the layer just under the bark) of the cutting and understock. Try to choose a cutting and an understock limb that are the same size so you can match the cambium layers on both sides, but if you can’t, one side will be adequate. 3. Layering – While not a commercial method of propagating rhododendrons, this can be a method for a gardener to grow an additional plant exactly like the parent plant. This is a another form of vegetative propagation. Simply pull a low limb of the plant down onto the ground, wound or notch the bottom side, cover it with loose soil mix and weight it down with a rock. It will take at least a year and possibly two before the limb is sufficiently rooted to be cut from the plant, though some evergreen azaleas root faster. The use of root hormone on the wound may speed the process, but is not absolutely necessary. 4. Seed – Raising rhododendrons from seed is a sexual rather than vegetative method of propagation, meaning that the resultant plant is not a clone (exact duplicate genetically) of its parent. When seed is grown from a species. the plant may look very similar to its seed parent, though when seed is gown from a hybrid the resulting plant could turn out looking very different. Of course controlled crosses between different parents and then raising the resulting seedlings is how new hybrids are introduced. Rhododendron seed is very tiny, almost like dust, so it requires a smooth fine surface in which to start growing. Peat moss or finely shredded sphagnum with about 1 part perlite mixed in, is a popular seed growing mix. Sow the seeds in a pot covered with a plastic bag or in a flat covered with glass or plastic. Generally no winter chilling is necessary to get the seeds to break dormancy. Keep the seed pots or flats in the 18Â°C to 24Â°C (65Â°F to 75Â°F) range. The seed will sprout in from 3 to 8 weeks (sometimes longer) and after they have formed their first set of true leaves, they can be transplanted into other flats or containers. Since they are so tiny, they will not stand frost until they are larger and some months old. 5. Tissue Culture – Tissue culture or micro propagation is becoming a very popular method of producing large numbers of rhododendrons for commercial use. Over simplified, it involves taking a piece of rhododendron wood and putting it into a test tube. Through the use of agars and auxins, absolute sanitation, proper temperature and lights, the piece of wood is induced to grow into multiple “seedling-like” growths with no roots. This tiny juvenile wood is then rooted. Needless to say this method is not for the general home gardener, though some “kitchen tissue culture” is being done.